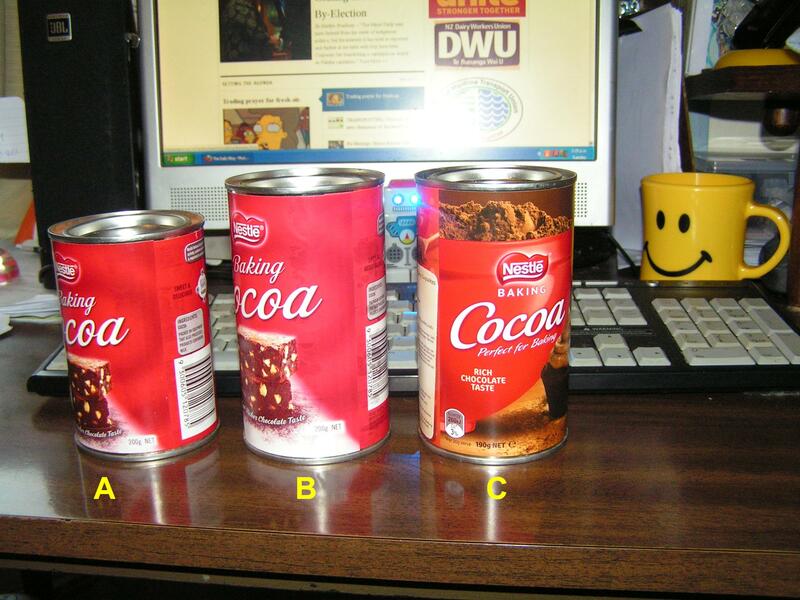 Three cans of cocoa tell an interesting story. Can A is the oldest, with an expiry date of April 2011. The can measures 110mm (H) x 75mm (D). It contained 200g net dry cocoa powder. We purchased Can B sometime in 2011 (?). The expiry date was March 2012, so it’s the second oldest can. Interestingly, it also contained 200g net dry cocoa powder. However, whilst the contents remained the same as Can A – the dimensions of the can inexplicably increased; 130mm (H) x 75mm (D). Same diameter as Can A – but 20mm taller. Contents remain the same net weight. A month ago we purchased Can C (expiry date, March 2015). The dimensions of this can is the same as Can B: 130mm (H) x 75mm (D). But this time, the contents decreased from 200 to 190g net dry cocoa powder. Ten grams less. So the up-shot? The can-sizes have gotten bigger – whilst the contents has reduced by 5%. It has recently come to my attention that two cans of Nestle Baking Cocoa measure 110mm X 75mm, whilst the other measures 130mm x 75mm. Both contain 200g net cocoa powder. The smaller can measuring 110 x 75 has a “best before” date April 2011. The larger can, 130×75 has a “best before” date March 2012. It appears that you have increased the SIZE of the can, whilst the contents remain the same. Is there a reason why the size of the cans was increased, by 20mm in height? And can you confirm that the price stayed the same; increased; or reduced; when the change was made from a 110mm height to 130mm height? Unfortunately, I never retained the receipts for Cans A and B, otherwise I could compare prices. But what’s the bet that the retail price probably increased? Amanda Banfield, managing director of Australasia for Mondelez International, the parent company that owns Cadbury, said she expected a backlash. She pointed to rising packaging costs and a lift in the price of raw materials. The main ingredients are cocoa, sugar and milk. So let’s have a look at the prices of raw ingredients. 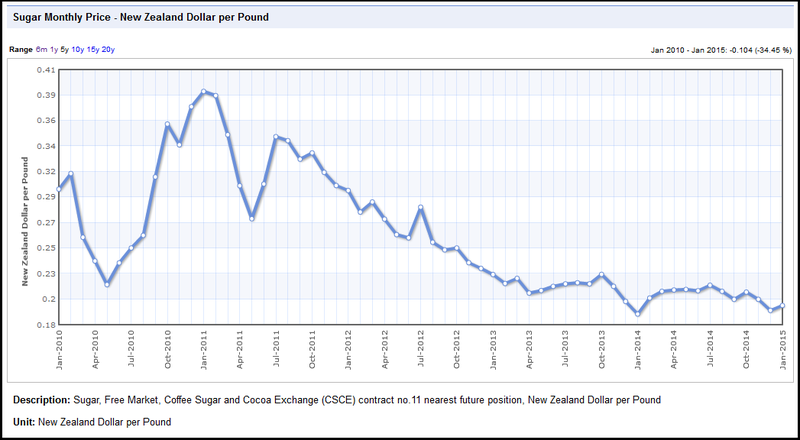 So the rationale for Cadbury’s decision to de facto increase their prices cannot be blamed on sugar, which is cheaper now than it was, five years ago. 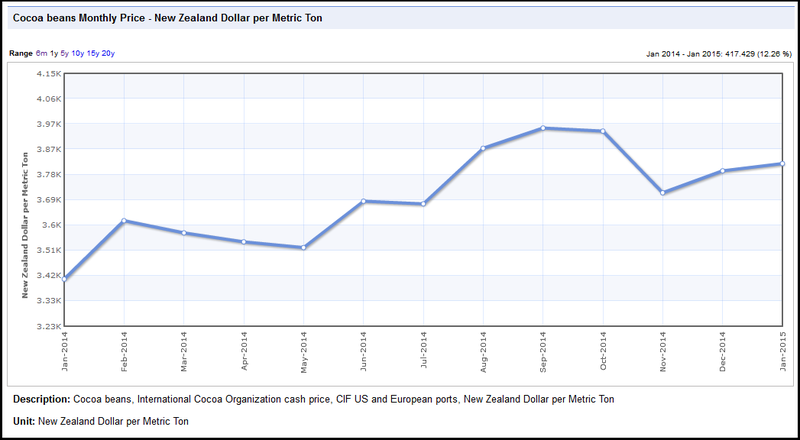 It would be interesting to note if when the price of cocoa beans collapsed to NZ$2,601.96 per metric ton, in March 2013, did the price of a Cadbury’s bar of chocolate increase in size? Or fall in price? 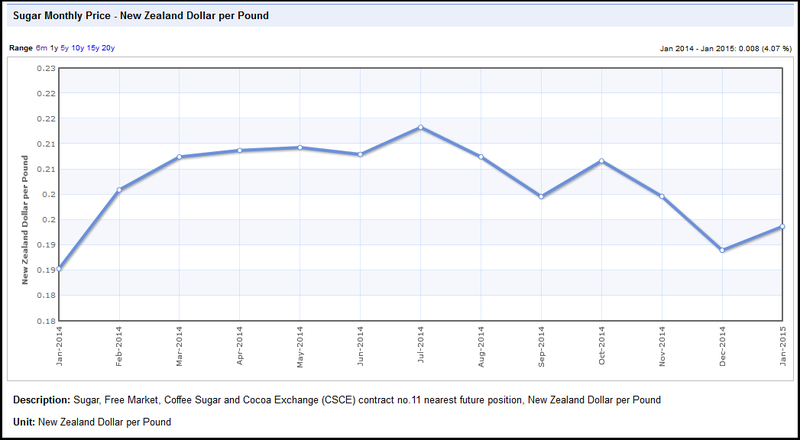 So with commodity prices for sugar and cocoa beans lower now than five years ago, and with low inflation, what other cause could there be for the de facto price price of Cadbury’s chocolate bars? Perhaps the answer lies with Kraft’s acquisition of Cadburys for £11.5 billion (US$18.9 billion) in 2010. Kraft financed the take-over deal by borrowing a massive £7 billion (US$11.5 billion) to finance the deal. 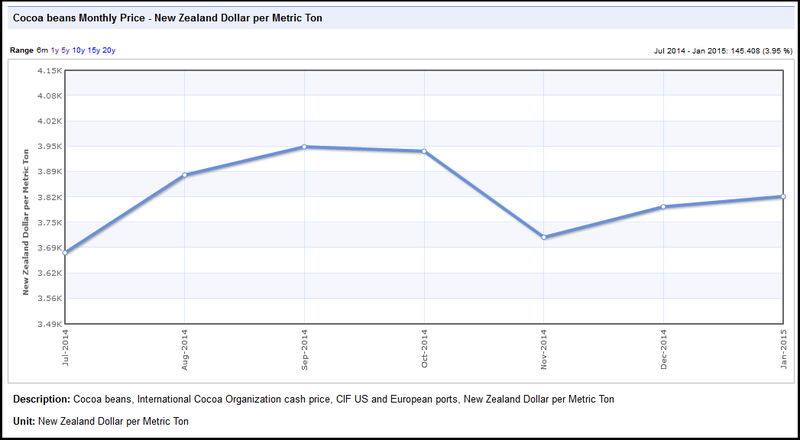 However, the New Zealand branch of Cadbury’s did not return a profit to it’s parent company (Mondelez International) until three years later, when it paid a dividend of NZ$40 million to its parent company, Mondelez. According to statements, Cadbury NZ’s profit tripled to $11.6 million, from $3.5 million a year earlier, even as costs fell by 2.3%. 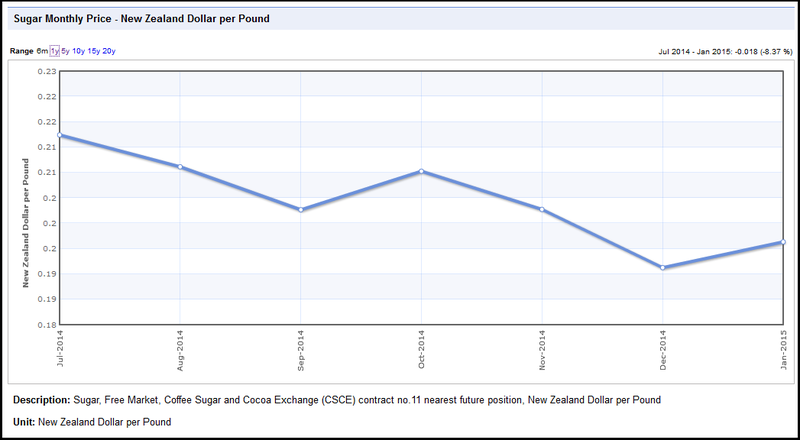 So despite falling costs, and increased profits, Cadbury NZ was struggling to make dividend payments to it’s parent company, and meanwhile Kraft was committed to servicing a £7 billion (US$11.5 billion) loan which had financed the acquisition in 2010. The reduction in Cadbury’s chocolate bars can therefore be attributed to Kraft’s indebtedness rather than the official company line of increased costs. 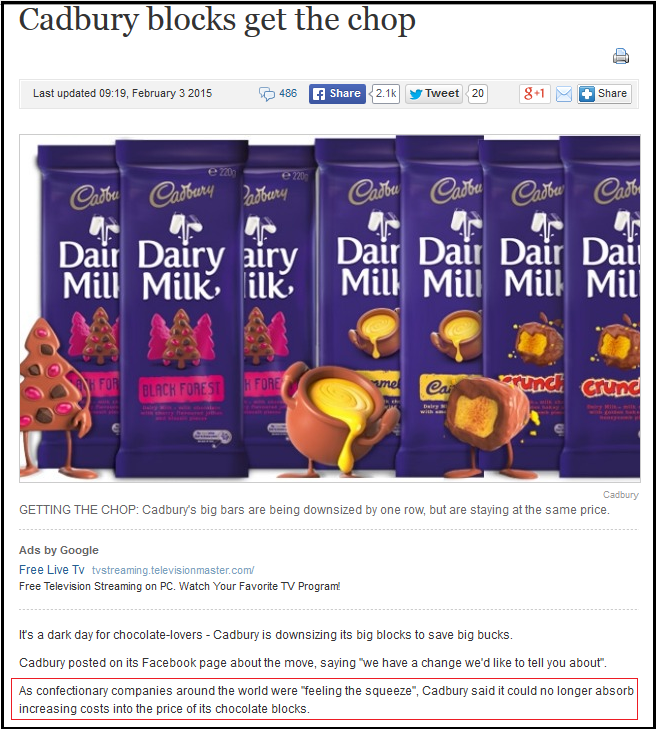 Unless Cadbury is lying in it’s financial statements, their costs have actually fallen, not increased. As with many corporate takeovers, the benefits do not necessarily accrue to the public. The number one beneficiary is almost always shareholders, and consumers come a poor second (or third, or fourth…). In this case, reducing the size of Cadbury chocolate bars by 20% is equivalent to a price increase, and Kraft’s shareholders will reap the rewards of increased profits. Not exactly a sweet deal for New Zealand consumers. On 15 February, I contacted Statistics NZ, to enquire how SNZ views reduction in product sizes, whilst retail prices remain the same, in it’s calculation of the Consumer Price Index (CPI). The CPI measures price change in a “fixed” basket of goods and services, which means that we aim to measure price change based on quality being constant. In an instance where the quality (in your example, the weight/size) of an item changes, we show a price adjustment to account for the fact that the quality of the item has changed. As an example, if the size of a can of beans goes from 300g to 330g for the same price, this is shown as a price decrease for that item in the CPI. Likewise, if the can of beans went from 300g to 250g for the same price, it would be represented as a price increase. 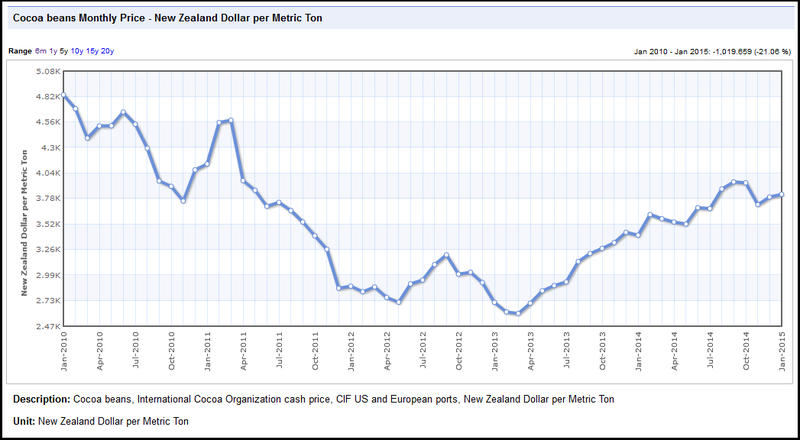 So according to Mr Lum, Cadbury’s “switcheroo” with product sizes, will not materially distort CPI price measures. This blogpost was first published on The Daily Blog on 24 February 2015. Disagreement about how to reduce poverty and inequality is looming as one of the big debates of election year. There has been considerable commentary made by Labour’s critics and political opponents that Labour was an incompetant economic manager, during their nine year term in office. The reality, though, is somewhat different. There are many things that Labour did well and some not-so-well. But the records speaks for itself. The following is data, in the form of easily understandable graphs, from Trading Economics, an American website. They collect data from the IMF, World Bank, Statistics NZ, the Reserve Bank of NZ, etc, (the usual motley crew of subversive, left wing organisations) to compile their finished presentations. National was in power from 1990 to the end of 1999. Labour governed from the beginning of 2000 to the end of 2008. National took office After November 2008. Some politicians use long-term unemployed as an election weapon, to win electoral support. However, despite their mis-use of the facts and figures, long-term unemployment was dropping in the last ten years. Not that certain politicians would admit it, though. Note how long-term unemployment rose in the late 1980s and spiked in the early to mid 1990s. Can we remember what happened to New Zealand in that time? The terms “Rogernomics” and “Ruthanasia” might jog our memories. Despite claims that Labour “spent up large” during their nine year term, the truth is completely different. As the IMF data shows with crystal clarity, Labour paid down debt. 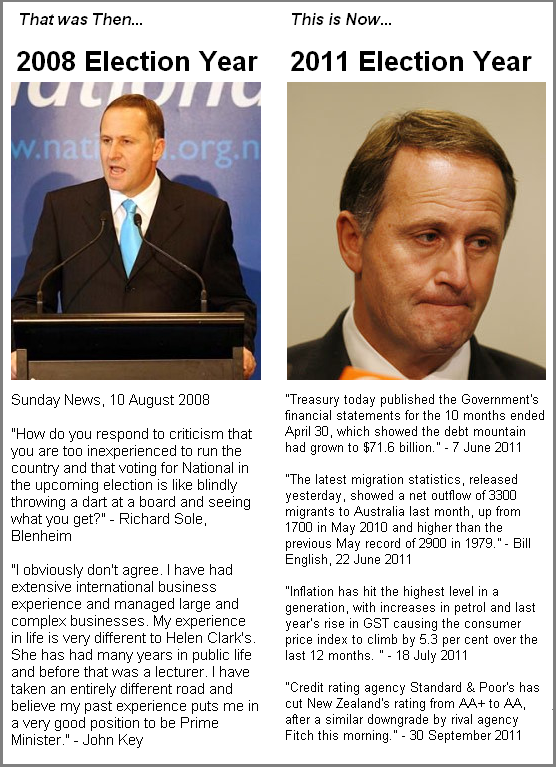 It was not until National came to office that debt levels took of again. It could be said, with considerable truth, that Finance Minister Michael Cullen ran the government accounts with a fiscal discipline that would make Scrooge sit up and take notice. One of the many “charges” made by neo-liberals against the Labour Party is that centre-left governments are poor stewards of the economy and are anti-business. Yet, the World Bank data below shows quite dramatically how well New Zealand’s economy fared in the 2000s. Our growth was such that a common complaint from business was a lack of skilled, experienced staff. The early 1990s were marked by “Ruthanasia” – a continuance of Roger Douglas’s extremist neo-liberal, free market policies. All socio-economic indicators worsened during Ruth Richardson’s tenure as Minister of Finance. The World Bank data below shows how New Zealand’s economy was practically crippled under the tender mercies of the New Right. It was not till 2003, under Labour’s governance, that the economy began to grow. As an aside, there were took tax cuts during the 1990s. Result: minimal benefit for the economy. Labour increased taxes for top income earners in the early 2000s. Except for a short-term ‘dip’, the tax rise doesn’t seem to have impacted on the economy. This is the bit which shows how much we sell overseas (export), compared to what we buy (import). Exports can be wool, timber, fish, dairy products, company profits, etc. Imports can be fuel, consumer products, vehicles, raw materials, heavy machinary, etc. The shaded gray should be above the ‘O’ line, instead of below it. This graph is an interesting bit. When John Key and Bill English refer to the previous Labour government expanding State expenditure, this is what they are referring to. And they are correct – but only half correct. As per usual, they are telling you only half the truth – and leaving out the next, important bit. Look at the next graph below, 1990 – 2000. In the graph below, it is clear that the National government from the early to mid 1990s (commonly referred to as “Ruthanasia”) and in the late 1990s, consistantly cut back on expenditure. Some of you may recall horror stories of those times; ex psych patients living rough, in toilets, with no State-community support; market housing rentals; and hospital waiting lists far longer than anything we have today. On 3 April 1998, Southland dairy farmer Colin Morrison (42) died on a waiting list, awaiting a triple heart bypass surgery. In death, Mr Morrison symbolised everything that was terribly wrong with the health system in the late 1990s. Public anger mounted as an unpopular government seemed unable to respond to concerns that our public services were being run down in the name of “efficiency”. That is the reason why Labour spent so much during it’s term: to make up for the lack of social spending in the 1990s, and to meet growing public clamour for social services to be better resourced. Contrary to the fantasies of some history-revisionists, trying to paint the previous Labour Government as “bankrupting the country”, Cullen actually posted some fairly respectable surpluses. 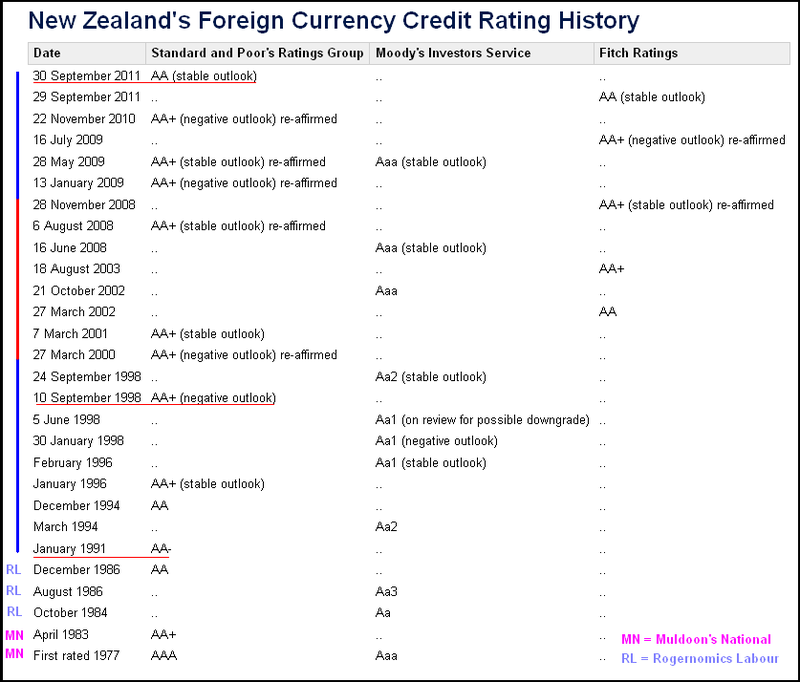 The following data-sheet shows New Zealand’s credit downgrades from 1977, when Rob Muldoon was Prime Minister, to the present. Note that three credit downgrades happened duting three National governments; 1991, 1998, and this year. And if you include the Rogernomics period – that makes FOUR neo-liberal governments that were downgraded. Do credit ratings agencies seem “risk averse” to new right governments? Do they prefer centre-left governments? The prison sentenced population demonstrates continuous and steady growth since 1986. The seasonal pattern of reduced numbers toward the end of each year is well established, and reflects the influence of the prisoner Christmas release policy 1 , as well as cycles of activity involving Police and the Courts. Notable is the sharp upturn in numbers which commenced in mid-2003, continuing through to June 2007. A closer look at the period 1962 to 1996. Note the huge ‘spike’ in the prison population from 1986 onwards. Except for occassional dips, the prison population has continued to rise steadily since the mid-1980s. It cannot be a coincidence that New Zealand’s entire socio-economic fabric was unravelled and “reformed” in a process commonly referred to as “Rogernomics”. The process of “economic reform” continued into the 1990s, referred to as “Ruthanasia”, up until 1996. The prison population, though, continued to rise. The ongoing effects of “Rogernomics/Ruthansia” are ongoing to the present day. So, the reality is that a certain number of those 4,000 people who “ came off the unemployment benefit ” may well have moved on to another benefit? Because that is what Bennett is saying, quite clearly, ” the total number of people on welfare … [rose] by 0.1 per cent in September to 328,496 “. The article also does not state where those 2200 youths who “came off welfare ” went. Did they find employment? Is is full time or part time – and if the latter, are their wages still being subsidised by WINZ? Have they move “side ways” onto another benefit? Are they in training/education, or one of WINZ’s many, ultimately-futile “training” programmes? The story simply does not enlighten us. Thank you, Paula, you’re a real fountain of wisdom. But then continues with “when seasonally adjusted, the index actually fell by 1.1 per cent in September…”. This seems clearly at odds with current government policy of curring back the civil service. The military and other government sectors have lost at least 2000 workers, with more job losses planned. The question that springs to mind is that if the drop in unemployed is real – is it due to new jobs or new job vacancies? The difference may seem subtle, but is very real. New jobs are an indicator that the economy is beginning to grow again. Job vacancies are existing jobs that have been vacated for one reason or another, and are being replaced. It is sometimes referred to as “churn“. Annual wage growth in the adjusted LCI (which measures changes in pay rates for a fixed set of jobs and excludes performance related pay increases) remained steady at 3.4% in the March 2008 quarter. This is the equal highest rate recorded since the LCI began in 1992 matching the annual increase for the December 2007 year. The unadjusted LCI (which includes performance related pay increases) shows annual wage growth of 5.4% in the March 2008 quarter, up from 5.0% at December 2007. Good times, eh, my fellow New Zealanders? 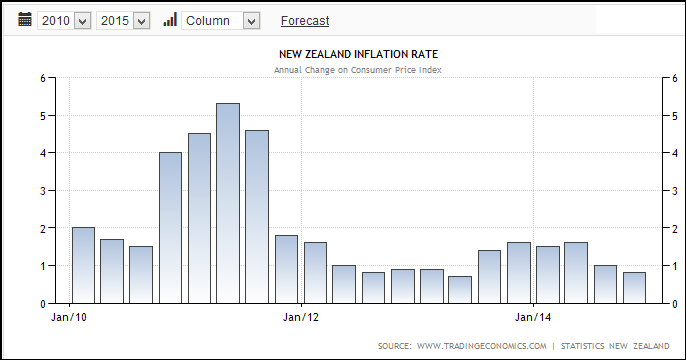 Despite John Key’s priority-pledge to raise wages – and not just by 38 cents!!! – we now have a record flight of New Zealanders moving to Australia – 3300! Which indicates that this current government has done very little of practical value to motivate New Zealanders to stay and help build our own economy. Two tax cuts have certainly not worked the “magic” that Key, English, et al, had hoped. Be cautious about media stories that do not present the full story. A bit of ‘digging’ soon yields a fuller picture. Be cautious about politicians who promise you the world (you’ll be the one paying for it).